All Products > "80824 Constructo Pandora 1:85 Display Model"
HMS Pandora was a 24-gun Porcupine-class sixth-rate post ship of the Royal Navy launched in May 1779. 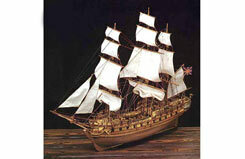 She is best known as the ship sent in 1790 to search for the Bounty and the mutineers who had taken her. She was wrecked on the return voyage in 1791.